How Three Utilities Made Members Happy - Ruralite Services, Inc.
Federal workers have a friend in public power. 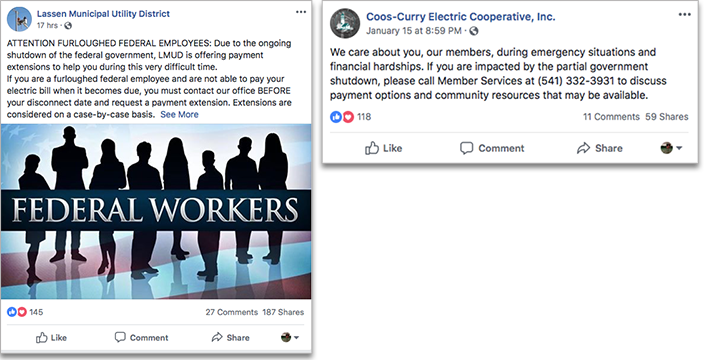 During the 35-day partial government shutdown, public power utilities waived fees, offered extensions and broadcast bill assistance. Why? These utilities put consumers first. Not only did this move demonstrate how we are More Powerful Together; it made consumers happy. Last week we shared consumer satisfaction insights from Touchstone Energy Cooperatives. Ready to take these facts and turn them into action items for your utility? Start by learning from your peers. This 14,000-member co-op on Oregon’s coast won a 2016 Spotlight on Excellence Award for their strategic planning process. The utility-wide effort focused on one goal: deliver a satisfying member experience. All 63 employees were broken into cross-departmental groups. Together, these groups redefined the co-op’s mission and values, forming a new strategic plan to guide Coos-Curry Electric. To foster high member satisfaction, Coos-Curry Electric focuses on members, operational excellence and keeping costs affordable. Be reliable. People are happier when they have power. South Central improved reliability by upgrading 20 substations, added an outage management system with texting options and removed 13,000 trouble trees. Making changes? Share. Arborists talked face-to-face with more than 10,000 members impacted by the tree removal effort. Texts are sent to almost 3,000 subscribers before planned outages. If there are plans to interrupt power locally, lineworkers knock on doors to tell members. Keep staff informed. Do all your employees know the news before your consumers? South Central focused on sharing updates internally first. They also focused on better internal communication during outages. Members first. Can your consumers pay for power in their pajamas? Carroll EMC’s members can. Apply for service online, pay for power as you go at a kiosk or through an app, and get outage updates on the go. The co-op constantly looks for ways to make life easier for members. Secret shoppers keep staff on their toes. A member advocate—yes, that’s a job title—actively looks for ways to help co-op staff support members. Empower staff. All staff share a common goal: Pursuing Greatness Together. Volunteering isn’t just encouraged. It is paid for, up to eight hours a year. A pay-for-performance bonus is earned both as a team and based on how much an employee gives back to the community. Staff members are surveyed annually to make sure everyone is on the same page. Dig into two of these best practices in this week’s video tutorial, Happy Member Ideas. This is the second video in our two-part tutorial on boosting consumer satisfaction. To learn about happy member attributes and engagement strategies, watch the first installment. How do you make consumers happy? This video tutorial is based on a presentation I made at the 2018 Southeast Regional Member Services Conference. Many other public power utilities are rocking consumer happiness, too! Add your ideas in our comments section, or send them to meganm@ruralite.org so we can share your best practices.